How to Make Time to Invest in You! Hola! I’m so glad you landed on this page. I’m assuming you are either an EE subscriber, an educator who landed here accidentally or someone suggested that you check out my site. No matter how it happened, I’m so glad you’re here! I started this year’s posts with my educator edition of 6 Things to START and STOP This New Year. As promised, I wanted to put out another post aimed to empower you. 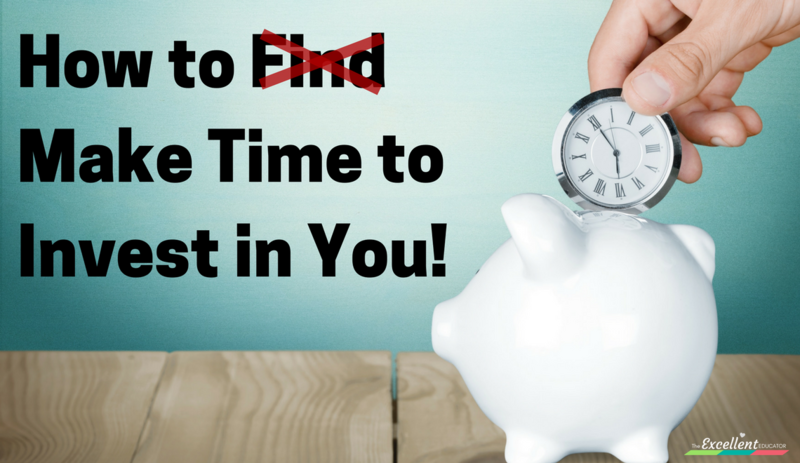 This week my topic to share is How to Find Make Time to Invest in You! People always say they can’t find time to do things. I don’t totally agree. It can be really hard to FIND time to do things, which is why you have to MAKE the time. Have you ever been so busy that you looked up and realized that you forgot to eat? (Hopefully I’m not the only one!) Although we all know how important eating is, if we don’t pause whatever it is we are doing and make and effort to eat, time will slip by and it won’t happen. So if we must make time to do something so essential like eating, how much more do we need to make time to do other things like invest in you? With people being busier than ever, priorities are always shifting but there is still a way to make time to invest in something that should always be a priority – YOU! The first step in making time to invest in yourself is to define your current priorities. Everything that is important to you may not be a current priority. This means you have to sort through everything with importance and tease out those things that you want at the forefront of your focus right now. Not everything that is important will win your time! I’ll give you an example….The year I decided to build this website and do private trainings, there were a ton of other things that were also important to me. I had to make a tough decision about what things were my top priorities at that time. I wanted to do it all but I knew that wouldn’t be feasible nor healthy to try to focus on everything. Sometimes it’s better to do a few things well and pace yourself than do many things mediocre. I decided that my priorities would be building my website, my full-time job, and investing in me! I will be honest, this was one of the first times that I intentionally decided to prioritize self investment and intentionally put that high on the list. What’s ironic is that I decided to invest in me at the time when my life was the busiest. Statewide overnight travel and training with Georgia State always keeps me pretty busy. Providing private trainings to schools on my off time, was another added part to my already busy schedule. Many people wondered how I would find time to do anything else – and truth be told, I was one of them. I wondered how I would add the tasks of building a website/blog (which I had no clue how to do) and invest in me but I found a way to do it and it’s been a success! How did I make time? I’m glad you asked! There are actually three things that I started doing that will work for you too! I evaluate my social media usage. Social media is a great new age tool that gives us instantaneous access to information but I personally think there are drawbacks to it as well. When you hear social media, you may all think of the typical social media channels like Facebook, Instagram and Twitter but I also include YouTube, Pinterest, and even news apps for the purposes of this post. I consider social media to be any platform that allows you to get lost in the deadly, time-killing finger scroll. Now don’t get me wrong, I am not opposed to people being on social media. I actually hope you connect with me on Twitter and Facebook 😉… but I do think it’s worth evaluating how much time you actually spend on your favorite social media platform(s). Even if you only spend 10 minutes on it three times a day, that’s 30 minutes that you could use towards doing something else that you’ve been trying to find time to do. If you have 30 minutes to spend scrolling, you’ve got thirty minutes to read more, or engage in some cardio or invest in you, however you choose! I develop a schedule and set up a system for the things I wanted to do beyond my full-time job. I believe one of the only ways to be productive and get things done is to have a schedule and create systems. Just think about your classroom. Even if you’re not a super structured person, you have a schedule and systems in place. You have set times for arrival and departure, for different segments of your day, and for special events that will occur each month. Most people looking at all of the things a teacher has to do, would think it’s impossible to get done but if you have a schedule that you stick to, you won’t have to wonder when to do certain things and you’re more likely to get everything done. Systems also add to you getting things done. Systems are the process for the way you do things. Think about your arrival time and dismissal time at school. I know this is an excellent educator reading this so I bet you have a certain way that you do arrival and dismissal each day at school. That means you have established a system. I am sure you have plenty of other systems as well. A system for lunch, a system for bathroom breaks, a system for parent communication, etc. Much like these examples, if you are wanting to add self investment, to your already busy life, you are going to have to schedule it and create a system for how you are going to do it! Even though I have a daily schedule that I follow I also have to set aside time to schedule things for me. If I don’t schedule things, they are probably not going to happen. When things make it to my calendar I am more likely to do them. Go ahead, schedule that massage, that “you” time, that thing that you keep saying “one day” to. Put it on your calendar or in your planner just like you do all your other important items and make it happen! You’ve probably picked up on the fact that I am a planner and schedule everything. No matter how much I plan and schedule things, there are always idle times in my day that will happen. These are times when I am on the road traveling, sitting in Atlanta traffic, waiting in a long line at the store or waiting at an appointment. These idle times have become some of my most productive times due to my creativity. I love to read but found myself becoming too busy to steal away time to read as much as I wanted. I decided to always keep one of the books I was reading with me. This is so convenient now that we have access to ebooks. Whenever I am at Walmart or anywhere and there is usually a long line, by the time I reach the checkout, I catch up on reading while I wait. I do the same thing at appointments when I have to sit in the waiting room. I even have audio books so I can “read” while I am in traffic or on a long road trip to one of my GA Pre-K trainings. I truly surprised myself how many books I was able to read once I got creative and maximized my idle time. By getting creative I was also able to make time to consistently workout, continue my bilingual journey with Spanish and continue to invest in me in various other ways. I don’t know what your current goal is for self investment, but it is my hope that you first prioritize you, then consider my tips to either start your journey or continue it! Decide on a weekly, monthly, quarterly or even a once a year investment. Here’s the reminder you might need….YOU DESERVE IT!